Vice-Chancellor and CEO, Professor Annabelle Duncan, has announced that she will not extend her contract when her term ends in August 2019 – bringing to an end almost a decade of service to UNE. Annabelle first joined UNE in 2010 as Deputy Vice-Chancellor Research. In this role she successfully elevated the University’s research profile, building capacity in key areas such as agriculture, mathematical analysis, environmental sciences and health. She was appointed interim Vice-Chancellor in March 2014 following the departure of Professor Jim Barber. A competitive global recruitment process followed and culminated in Annabelle’s appointment to the position of Vice-Chancellor in August 2014 – a role to which she brought strong commitment to strategy, research and teaching excellence, as well as community engagement. She oversaw the successful conclusion of extensive infrastructure development and improvements under the umbrella of the $46 million Integrated Agriculture Education Project and is currently sponsoring initiatives such as the UNE Boilerhouse Discovery Space redevelopment project and Discovery Voyager. These projects engage with young people across the state to encourage a love of lifelong learning and awareness of what UNE offers in terms of further education. 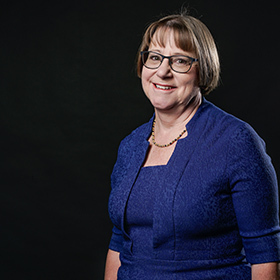 Annabelle has worked closely with University alumni throughout her tenure as Vice-Chancellor often referring to them as the standard-bearers for UNE and has enthusiastically supported events to promote meaningful engagement with alumni and donors. Before joining UNE, Annabelle spent 16 years at CSIRO, including six years as Chief of the Division of Molecular Science, during which she acted as advisor to both the Commonwealth Government and the United Nations on biological weapons control. She has also served in managerial roles with the Bio21 Institute at the University of Melbourne and the AgriBio Institute at La Trobe University.